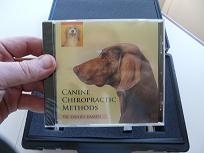 You get both the horse and dog chiropractic technique DVD's. Save $35.00 when you buy both together. You also get Dr. Daniel Kamen, D.C.'s 35 minute Equine Skeletal Anatomy DVD. The horse DVD is about 3 hours. The Dog DVD is about 2 hours. These are the same animal chiropractic techniques used by professional animal chiropractors worldwide. Each DVD shows you step-by-step how to perform each move an evaulation. Dr. Daniel Kamen, D.C. is the author of "The Well Adjusted Horse," "The Well Adjusted Dog," and "The Well Adjusted Cat."